Since 2007, the Federal Emergency Management Agency (FEMA) has declared more than 1,000 disasters in the United States alone. Whether they are natural or man-made occurrences, community leaders, first responders and military organizations should be adequately prepared to respond. 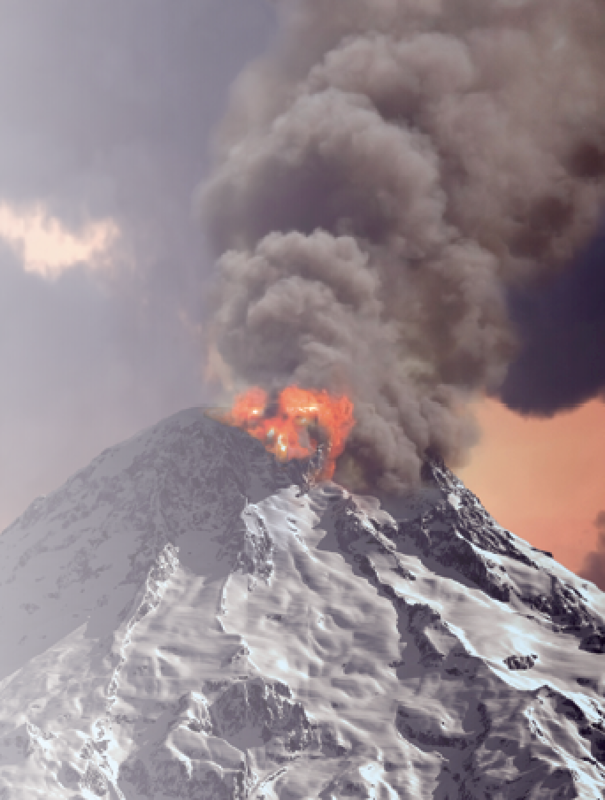 Continuity of Operations (COOP) plans effectively keep government agencies performing essential functions during a wide range of situations, from a simple failure of an IT email server to something catastrophic, including wildfires, hurricanes and earthquakes. Without a backup communications plan in place, it’s difficult — and sometimes impossible — to make certain these government agencies are able to take care of their communities. As such, developing a solid communications COOP plan is critical to protecting these infrastructures. One common mistake found in communications plans is a reliance on perceived system redundancy or invulnerability where none exists. Systems failures often include extended power outages. Even if local power can be restored to central offices by backup generators and batteries, extended power outages can cause telephone and internet networks to fail. Although network planners take great pains in building and designing diverse path routing of terrestrial links, several examples have proven route diversity isn’t fool-proof. 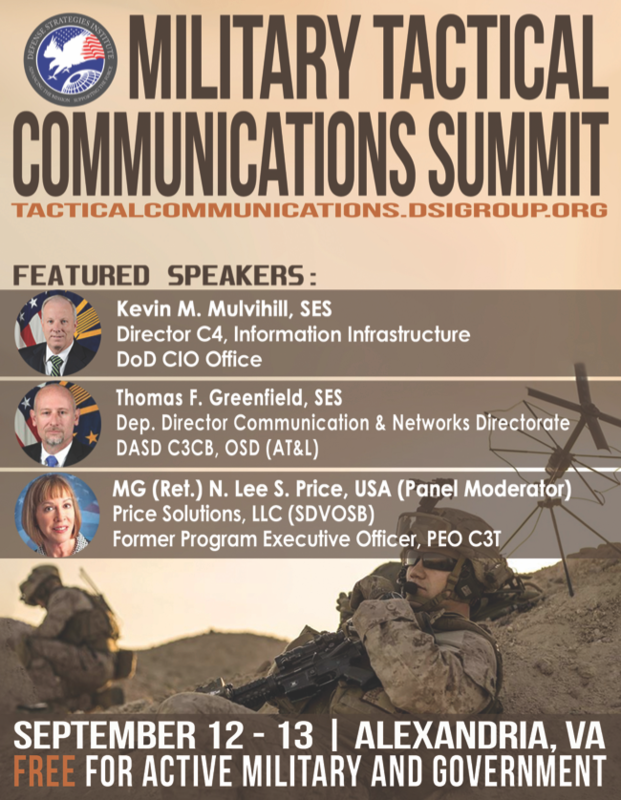 However, military and emergency response organizations rely heavily on terrestrial networks to safeguard critical information. When these networks experience outages for any reason — poor weather conditions, human error and even malicious intent — irreparable damage can occur. Baltimore, Maryland found this out the hard way when a derailed train caused fire to erupt in the Howard Street Tunnel. In addition to rail traffic, the Howard Street Tunnel is a major conduit of fiber optic cables servicing Baltimore’s Northeast Corridor for internet and telephone service. When the CSX train derailed, a chemical fire ensued and blazed through multiple bundles of fiber optic cable on both sides of the tunnel. Unfortunately, fiber bundles on one side of the track were part of the redundant path for fiber bundles on the other side. In this case, the path diversity was not as robust as was needed. A better solution for COOP plans is to provide redundancy over satellite. Satellite communications (SATCOM) provides true diversity for terrestrial links and is much more than just a redundant path. 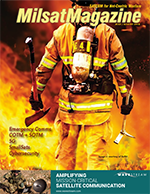 Using SATCOM in a COOP plan gives disaster recovery personnel a great deal of flexibility. Because satellite communication systems don’t rely solely on local terrestrial grids, towers or fiber optics to send signals, they are the perfect communications solution to add to any COOP plan. Satellite networks offer fast, non-stop connectivity to support all modes of communications that government agencies, emergency response and military organizations require during and after an event. Not only can SATCOM be used for critical voice and data connectivity, it can also be used for monitoring and reporting data. COOP Air Force Emergency Operations. During the Gulf Oil spill crisis, SATCOM was used for atmospheric monitoring and exfiltrating aerial data. High-tech planes equipped with auto-tracking antennas and state-of-the-art infrared cameras shot high-definition video images of the 3,300-square-mile Deepwater Horizon oil spill and tracked where the oil was spreading in the Gulf of Mexico. Over a secure satellite backbone, the images were transmitted to the U.S. Coast Guard and cleanup workers, giving them a view they could not have had any other way. Similarly, such airborne satellite communications are enabling first responders and the military to have a bird’s eye view of an emergency or situation at hand to help with intelligence, surveillance and reconnaissance (ISR) for military and emergency disaster response missions. By taking flight, airborne SATCOM systems are giving warfighters, first responders, HAZMAT crews and others a panoramic view of their surroundings. They are also getting a steady stream of updated and accurate information, making them more able to react to the situation at hand than ever before. Another example of SATCOM’s powerful Beyond Line of Site (BLOS) application is during large-scale floods. Aerial communications can aid people on the ground with safe evacuation routes based on the sky-down observation of impassible roads. Such information can be invaluable to emergency managers and public safety officials as they decide how to best apply their assets to respond to the flooding as part of their emergency management strategies and COOP plans. Satellite networks can operate independently of a terrestrial infrastructure and integrate seamlessly into any terrestrial network. This capability is available anytime, anywhere and under any condition. Satellite equipment can be stationed literally anywhere — land, sea and air. If military or emergency responders are on the move in a remote location, there is satellite equipment specifically designed for ideal size, weight and power (SWaP) that easily fits in a soldier’s rucksack or responder’s pack. This sophisticated satellite equipment has the power to deliver high throughput data communications but is efficient enough to run for extended periods on a single battery. Satellites have the ability to provide true diversity for terrestrial links and assurance for emergency teams and military personnel that their messages will get through to the right people. While SATCOM can be more expensive than its terrestrial counterpart, satellite costs can be reduced by using a shared satellite network. During a disaster when operational continuity matters most organizations can prioritize first responder satellite traffic in a shared network environment. An additional feature of a strong COOP plan is to implement geographic hub redundancy for SATCOM services. In a redundant satellite network, a satellite remote will automatically switch over to a secondary teleport in the event of an outage to the primary Earth station. 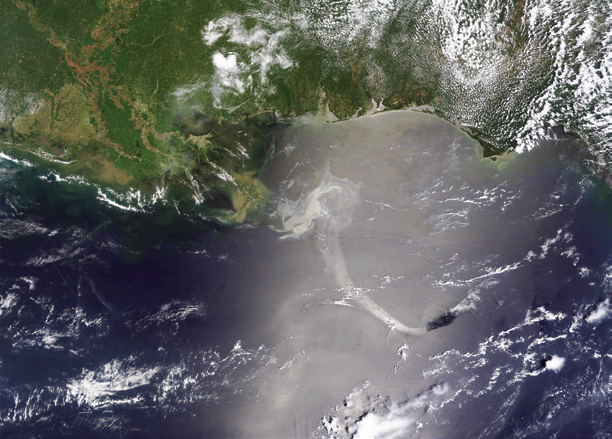 MODIS satellite image of the Deepwater Horizon oil spill that started on April 20, 2010 in the northern Gulf of Mexico. For example, if the primary hub infrastructure on the East Coast is unavailable due to a hurricane or other disaster, the remotes in the network will turn over to a redundant hub located on the West Coast. 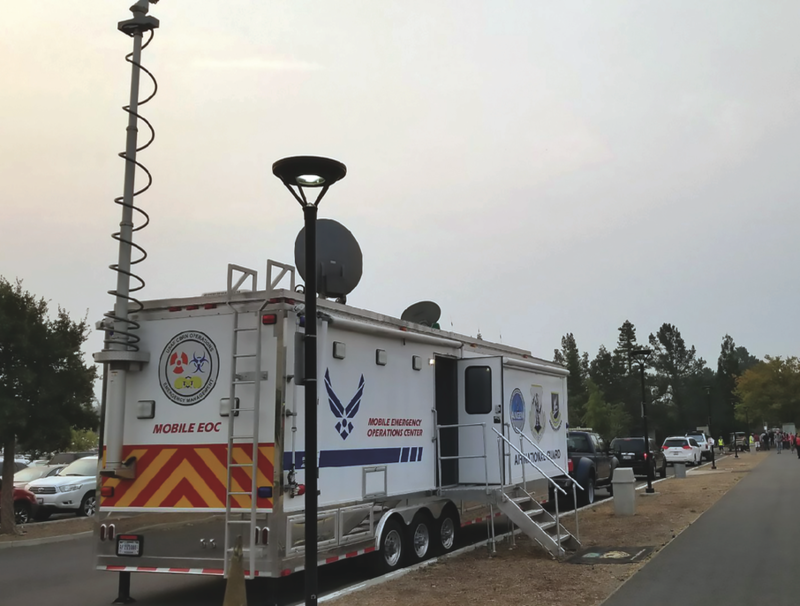 This technology proves particularly advantageous for the military and emergency responders who need to quickly communicate on the move and set up networks on the fly, even when there is no existing communications infrastructure. Having backup satellite communications will help the military and emergency responders to prepare for, and respond to, critical incidents with emergency assessment, medical assistance, relief, monitoring, evaluation and more. In the chaotic operational atmosphere of a military mission or emergency, obtaining and communicating clear and accurate information is vital. SATCOM by land, air and sea can provide a reliable picture of the extent of the disaster or mission at hand.Effective SATCOM networks operate from a flexible platform that supports multiple satellites and bands, including C-, X-, Ku- and Ka-band over commercial or WGS satellite frequency. As an integral part of a COOP plan, SATCOM helps military, first responders, government and all of those charged with protecting people, property and infrastructure to respond properly to any event, and executing their missions with a heightened degree of safety and success. Karl Fuchs is the Senior Vice President of Technology at iDirect Government (iDirectGov). Fuchs leads iDirectGov’s team of federal systems engineers and serves as chief architect for new product integration. Fuchs has more than 20 years of experience in the areas of technology and the federal government; kfuchs@idirectgov.com. While many realize the threats from fires, storms, biological events, pandemic outbreak and weather, there are many types of threats that can cause disruptions in operations and require critical communications.